It’s been a long time coming but I’ve finally packaged all my best material on new business growth into one overarching framework. Along with that I’ve changed the name of the site from theinnovativemanager.com to ignitionframework.com! This site’s purpose is to help ignite business growth, whether you’re a startup or an established business. Ignition Framework is designed to specifically help with this process. Too often startups or internal innovation programs end up resembling a flash in the pan rather than an effective and focused beam of energy. Startup founders get excited about their idea, tell their friends and even raise venture capital only to ultimately get crushed by one of the many risks inherent in creating a new business. The same goes for internal innovation programs at established companies. A team with passion and energy is formed, in some cases even a swanky new building is built to support the new innovation team, only for the concept to languish in layers of bureaucracy and analysis paralysis. Eventually company managers, concerned over the lack of a clear ROI to the initiative, redirect resources elsewhere and shelve the project. This is what I call a flash in the pan business initiative – it starts out with a bang, sparks of excitement and energy fly, only for the team to ultimately be disbanded. While the flash in the pan problem can be a result of poor market conditions or a lack of proper resources, too often the reason for failure is a lack of a structured and disciplined framework designed to drive the team to concrete business results as quickly as possible. Conditions are like the perfect blend of air and fuel when starting a fire. For new businesses, conditions that matter are the market environment, technology runway and the business model(s) to be deployed. When the market is ripe, the technology is ready and you have a business model to take your idea to the market, then you have ideal conditions for a new business. But just like with starting a fire, ideal conditions won’t ignite until you have a spark or catalyst. Catalysts are like the spark that ignites the air/fuel mixture. For new businesses, the catalyst is the team and the capital needed in order to take advantage of the market conditions. When the right team is paired with the right amount of capital (not too little or too much) surrounded by the right market conditions, a new business can ignite. Containers are like a well-designed fire ring or the chamber of a cannon. Having the right market conditions, team and capital is only as useful as the focus and direction of the team. Even in the best conditions, teams can lose focus on what they need to accomplish and ultimately fail. With a proper container, or framework, team effort is focused and directed in the most useful and effective ways to achieve immediate business results. With the Ignition Framework, team energy is focused and directed in a disciplined manner to make the most of every ounce of passion and capital invested into the initiative. It provides the focus and direction for the team similar to how the beam of energy in the video below is focused. This is a video of a transparent potato gun from Smarter Every Day’s YouTube channel. Notice the difference in this video between the flash in the pan. The flash in the pan had a lot of undirected and ultimately wasted energy whereas this video shows very clearly a spark (catalyst) inside a chamber with the right air/fuel mixture for ignition (conditions) and the energy is focused toward and directed (chamber) straight toward the potato. Ultimately the potato is shot and the goal is achieved. Like the chamber and barrel in the video, the proper framework can organize, direct and focus your team’s effort to take full advantage of your passion, the market environment and give the startup or new venture a strong chance at success. So what is the Ignition Framework? The Ignition Framework is a template for creating new business growth and tracking it’s progress. Below is an overview of the framework and the way in which business models can be measured against hitting the four key milestones of business model progression. The framework is designed to walk you through the process of creating a new business from a vague idea to a business that has achieved success and scale. 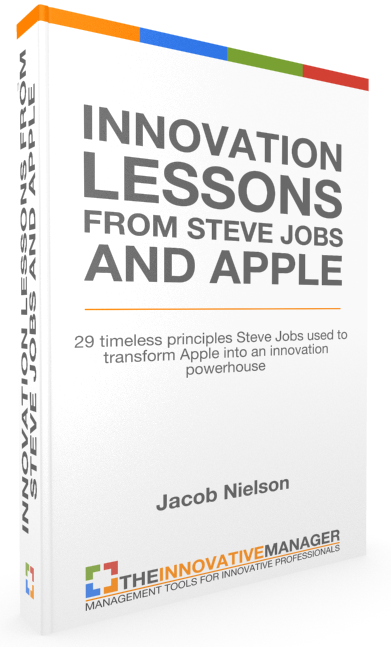 Every Innovation Journey starts with an idea for solving a problem. This is where you clarify what your idea is, what problem you are trying to solve and for whom you are solving it. This stage is usually done by an individual with passion around an idea at the expense of time and a little money during the research phase. This is the discovery phase where you come up with rapid prototypes in an effort to quickly find, test and validate your solution with your target customer. This stage usually requires more people than just the original founder. Typically it’s a combination of a business person, a technical/engineering person and someone who can design things to show customers as part of the solution experiments. This is the build stage where you take your validated solution to market with a brand, messaging and channel that generates consistent and sustainable sales volume. This is the most famous stage because achieving it essentially means you’ve overcome all the major hurdles associated with creating and selling a new solution in a market. Another reason it’s talked about the most is because achieving this stage means your idea has graduated from essentially a research project to a viable business that with additional resources could achieve more success. Once this stage is achieved, investment dollars are easy to come by! An important distinction from this phase versus the prior phase is the need for a minimum saleable solution. 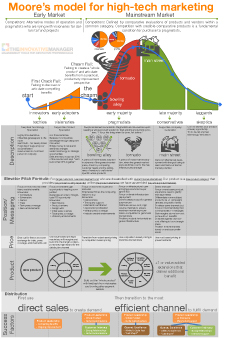 In the prior phase you validated the solution via MVP’s (anything you can show to customers that creates validated learning) and in this phase you used those learnings to create a solution you can sell. This is the scale stage where you rapidly extend your solution to more customers and define, model and optimize your business processes to handle the growth. This is a stage often talked about simply as scaling. Only a few businesses achieve this status but for those that do, the scaling process can be extremely challenging. High customer demand coupled with the need to hire many people quickly are signs that you are going through the scaling process. Typically scaling requires an enormous amount of resources. This is where investors also pile in because they can see the growth and want to be a part of it. While investment returns, on a risk adjusted basis, are typically the highest when investing in companies that have just achieved product / market fit, investment returns for helping businesses scale can also be very lucrative. 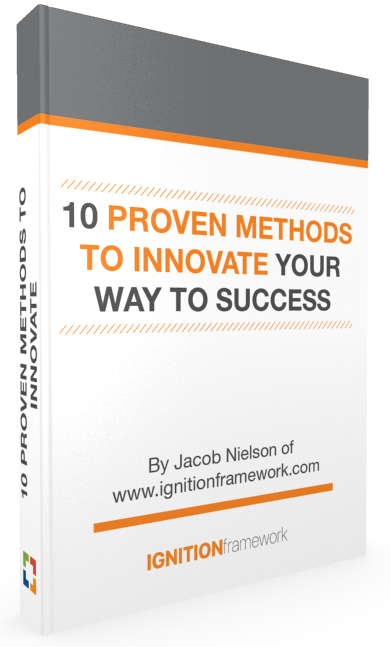 The Ignition Framework is a part of the overall Innovator’s Masterclass that I offer for free here. In that training I offer more than 100 free slides on how the process works and more details on specific examples. Be sure to check it out! Over the next several months I will be analyzing startups and internal incubation initiatives using this framework and will post my assessments. As you use this framework you’ll find that it helps organize and focus your discovery efforts in ways that maximize your chances of achieving real business results!